The evacuation of three European Parliament buildings in Brussels on Monday was triggered after the Belgian police detained a camouflaged man nearby and discovered a gun and a chainsaw in his car. The man, who was a citizen of Slovakia, told the police that he wanted to meet the European president, Reuters reports. Earlier, the media reported that the evacuation was a precautionary measure, prompted by a suspicious car parked in Montoyer Street. Twitter pictures from the scene showed a police robot apparently investigating the vehicle. 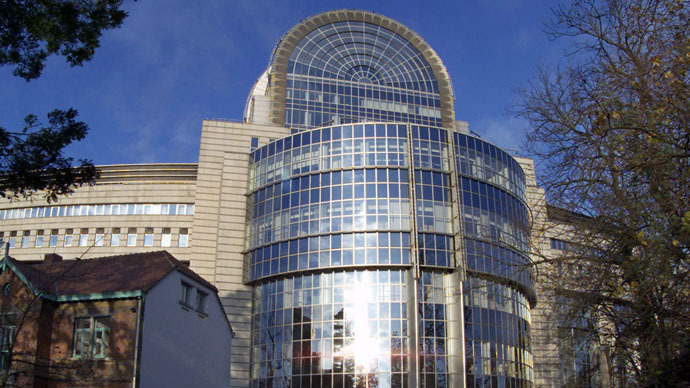 The inspection revealed that the suspicious car appeared not to contain explosives, the European Parliament spokesperson told Belga news agency. The evacuation was ordered at 11am local time, with the staff returning to their workplaces at around 1:30pm. The buildings in question are mainly used for administrative purposes as they host the Parliament’s human resources, communications and training departments, another spokesman told the Independent. Earlier, a similar car bomb alert was triggered by another car parked near the US embassy in the Belgian capital. An investigation proved that alarm to be false.